College roommates Aaron Baird and Jeffrey Green are both real estate agents and musicians. In December, they added coffee shop owner to their resumes when they opened Lenox Coffee on 129th Street. HARLEM — When Aaron Baird spoke in July with a real estate friend about an empty space on Lenox Avenue, he had no idea he'd soon realize a longtime goal — to open a spot where people could sip coffee and relax. 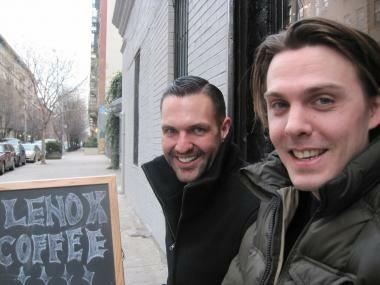 Baird told college roommate Jeff Green about the location at 60 West 129th St., and, after some brainstorming sessions and a brief renovation, Lenox Coffee was born. "It just happened," said Baird, 31, a musician who now lives in Brooklyn. "When I lived in Harlem, I never found a cool place just to hang out. I wanted a place where people could bring their laptop and just hang out all day." With the addition of specialty coffee from the 49th Parallel in Vancouver, British Columbia, and an interior design that Baird calls "shipwreck chic," the pair think they have a recipe for success. Green, 29, said they are excited about the cafe's potential — in spite of the odds that saw two area coffee shops close in the last couple years. La Perle Noir Cafe on Lenox Avenue and 131st Street shut down in May 2011 and was replaced by an Island Salad. Tasty News, which was located across the street, closed in 2010. Lenox Coffee is three blocks from Marcus Samuelsson's Red Rooster Harlem and across the street from The Lenox condos. Red Rooster has attracted new diners to the area and The Lenox supplies a regular stream of customers to surrounding businesses. Both Green and Baird think that Lenox Avenue has the potential to compete with the restaurants and bars that have sprung up on lower Frederick Douglass Boulevard. "I looked at who was living in the building across the street and it was a lot of students who I know are open to more than just Starbucks," said Baird. "In Williamsburg there are a million places to go hang out and they all have different personalities ranging from old world to the hipster. Why can't Harlem have that?" The shop is attracting long-time residents, too. "Everyone is coming in. We have a regular who has lived here for 60 years but we also get the people who moved here two weeks ago or are visiting for a month," Green added. "We want to be the classic shop that everyone in the neighborhood goes to." Since it opened on Dec. 5, Lenox Coffee has been offering its signature brew as well as tea and pastries. This week, the shop will start carrying sandwiches and salads. "The hard part of a place like this is educating people in a nice way about the coffee," Baird said. Green thinks New York is light years behind the West Coast when it comes to coffee culture. "We want people to appreciate slowing down and drinking a cup of coffee instead of chugging it on the way to the subway. Once you have our coffee a couple of times and your taste buds learn it, it's hard to go back," Green said. Baird said they are thinking of experimenting with longer hours because there are times when they have to kick customers out at 6 p.m.
"The challenge is dialing into what the neighborhood wants. Do they want vanilla lattes or frappuccinos? We are trying to keep it simple. We wanted a coffee house where less is more," Green said. Green and Baird were roommates at the New England Conservatory of Music. Green plays the trombone and Baird is master of the double bass. When Baird opened his own real estate shop, he pulled Green in and they became partners. Baird has experience as a barista and Green has worked as a waiter. When he's not showing apartments or at Lenox Coffee, Baird still performs. Green doesn't perform anymore — he has two children at home and time is scarce — but is toying with the idea of starting a brass band. While Green handles a lot of the financial affairs and operational matters, Baird focuses on the coffee, food and design. "We are oil and water," said Baird, comparing his high-energy personality to Green's more laid-back style. "But we make good business partners because we are each other's better parts." Inside, exposed brick walls, a tin ceiling and dark wood floors and tables dominate the space. Edison filament bulbs hang from the ceiling. Everyone has a laptop. "The style is turn-of-the-century, already used place that's been here for a while," Baird said. The area has had a few problems over the years. Residents complained about gun shots and loitering. An NYPD SkyWatch surveillance tower sat in front of The Lenox for several months. Elizabeth Moller, a lawyer who is expecting her second child and is working on a novel, lives a block away from Lenox Coffee and visits twice a week for a few hours to write. She said she likes that Lenox Coffee is quiet but not too quiet. "There was always a bit of trouble on 129th Street so it's nice to have something positive," Moller said. That's the impact Baird and Green say they want to have. "The first day I put the sign out, people thanked me. So we feel like we are doing something the community wants," Baird said.